Why Should I Hire The Button Law Firm? The Button Law Firm works tirelessly for you and your case. We are here to answer your questions, overcome your doubts and address your concerns during each and every step of your case. The dedication and time that we pour into each of our cases is incomparable and the defense knows it. We focus all our energy and resources on personal injury and wrongful death cases such as truck wreck crashes, car crashes, daycare cases, DWI wrecks, workplace injuries, negligent security as well as cases brought against insurance companies and product manufacturers. This is just to name a few. We typically sit down with clients to determine whether or not we would like to take their case on, after hearing all of the facts necessary. Can You Represent Me If I Am Not From The Texas Area? Yes, we have handled cases with clients from all over the country. Once we accept your case, we will work with you on travel and planning in order to fit your case’s needs. Am I Able To Read Your Client's Testimonials And Reviews? Our clients are some of the best people we know! Read some of our clients have said by following the link. We also feature reviews from clients and fellow lawyers on our Facebook page, Google Plus page, as well as Avvo and Linkedin. We always recommend looking at reviews before choosing a lawyer! Are You Featured On Social Media Websites? Yes, we are. We are very active on Facebook and Google Plus, AVVO and now on Youtube! Please check out our videos, we put a lot of work in all of our videos so they can be helpful to our viewers. We love to keep our clients and referral lawyers updated with the goings on of the firm through our Facebook posts! How Much Do I Pay To Hire The Button Law Firm? The Button Law Firm is hired based on a contingency fee. This means a fee is paid only when we win your case. If not, then no fee is paid. We have written an article detailing the ins and outs of our contingency fee basis. Read all about it here. This situation varies a lot. Depending on where you are in your case, whether or not you are treating, or being harassed by an insurance company, you will know best when you feel it is time to seek legal help. Regardless of whether or not you are sure, The Button Law Firm is always open to answering any potential questions you may have, free of charge. As always download and read all our FREE information. It is there for you. 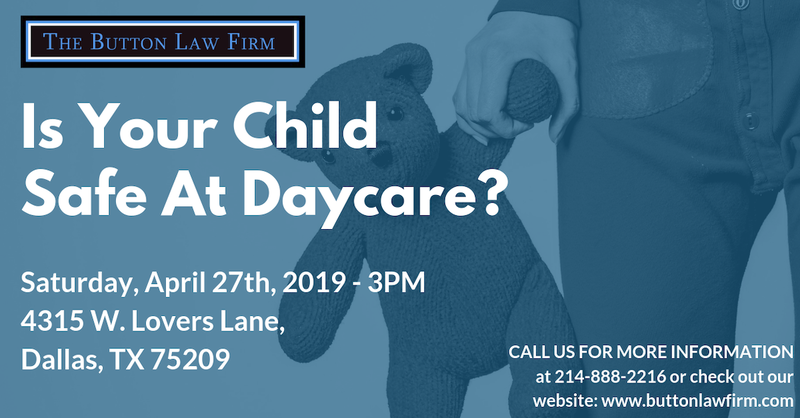 My Child Was Injured While Attending Daycare, What Am I Suppose To Do? The most important step parents need to take when their child was injured is to seek immediate medical attention. This is so critical because although the injury might seem minor to you, there might be an internal injury you might not be aware of, especially with young children that can't explain their pain clearly. Can I Handle My Own Property Damage Claim? Generally, yes you can. We rarely have to get involved in the property damage aspect of car wrecks. When we do, it means the insurance company has simply chosen to ignore you. Whether making a property damage claim on your own insurance or the at-fault driver's insurance, you can handle this on your own. Read this article for more information: 5 Steps To Handle Your Own Property Damage Claim In Texas. Check out our car wreck series on youtube. No. You do not have to give the insurance company a recorded statement, especially if liability is disputed. They will only find ways to use it against you. Read more about this question by following this link. Again, check out our free report on Secrets About Recorded Statements. Do I Have To Sign The Forms The Insurance Company Gave Me? No. You do not have to sign the forms that the insurance company sent you. They are likely trying to get access to every single medical record you have in your entire history as well as your driving history and all sorts of information they are not entitled to. They do not need that information to decide if you have been injured because their insured ran into you. Check out our article on this topic: Your Insurance Company Sent You Forms, Now What? We also have a video available for you.